Tactical Gear and Military Clothing News : Digital Concealment Systems (A-TACS FG) v. Hyperstealth Biotechnology Corp.
Digital Concealment Systems (A-TACS FG) v. Hyperstealth Biotechnology Corp. The camouflage design industry is an interesting landscape with many characters and varied perspectives on how business should be conducted. It is a world of secrecy in the sense that designers do not want their innovative concepts to be taken by the competition, but at the same time it is hard to market a product like camouflage unless you can show it to potential public or private buyers, and display its effectiveness. A lawsuit filed Friday, December 16th in Georgia Middle District Court could influence how camouflage design companies conduct this balancing act in the future. Digital Concealment Systems, LLC best known for their A-TACS Camouflage pattern has filed a complaint against HyperStealth Biotechnology Corp. seeking judicial declaration of their use of the A-TACS Camo pattern and would like the court to state that the new camouflage pattern does not infringe on HyperStealth's Patterns. Essentially DCS, LLC want free and clear use of their A-TACS FG pattern for licensing to their various partners. At the same time they want the court to issue a judgment in their favor for court costs, lawyer fees, and any other damages that they see fit. Going back in time a little more than a month ago explains the need for this recent action. As of November 15th A-TACS FG was introduced to the world through company channels as well as major industry publications. This gave the first true glimpse of the camouflage on actual uniforms, boots, rifles, and nylon tactical gear. Ten days later on November 25th, a cease and desist letter (ex.1) was sent from the legal counsel of HyperStealth asking DCS to stop offering products for sale that used the A-TACS FG pattern, effectively halting existing or future licensing of the camouflage. They stated that the new camouflage pattern is a virtual duplication of several of HyperStealth's patterns including Ghostex Alpha and Delta, SpecAM, SOPAT, Eurospec, and CAMOPAT. They also asked that the offending A-TACS FG be taken down from the company's website by December 5th or face legal judgement on the matter seeking compensation for any damages resulting from copying their patterns. This cease and desist letter combined with all patterns referenced are included in the court exhibits in (ex. 1, 2, 3) as well as the A-TACS FG pattern (ex.3). We have provided all of these court documents here so that you can judge for yourself. Obviously there is a lot more to it than just a photo image of a camouflage pattern. However, a picture can be worth a thousand words, especially when it comes to a court case where the science of camouflage development may be lost on many. If this case, DCS v. HyperStealth were to play out, which we hope is not the end result for the sake of both companies, it would be extremely interesting to see how HyperStealth explains that DCS copied their layering, fractals, fading, shadowing, coloring, three-dimensional effects, micro or macro patterns, or any other factor that plays into the overall design that was utilized in creating A-TACS FG. Not only do they have to show where their copyright was infringed, but how were they able to do so in respect to all of the patterns mentioned which works out to hundreds of variations. HyperStealth also has to show that they have a valid copyright for the patterns to begin any discussion on how they were infringed upon. 1. The A-TACS FG Camo pattern was created through a different process than the HyperStealth Patterns and, therefore, cannot constitute a copy of the HyperStealth Patterns using DCS’s patent pending process which creates the optical illusion of foliage and vegetation and objects when viewed at a distance, whereas HyperStealth’s patterns create visual noise through static fractals. Clearly Digital Concealment Systems was quick to react to these reactions in what may be a move to gain jurisdiction on any resulting court case. They are based out of Alabama which is much more convenient to the Georgia courts when compared to any proceedings that would presumably play out in British Columbia where HyperStealth calls home. More likely they are trying to get this matter resolved as quick as possible so that they can continue business as usual, especially considering the upcoming SHOT Show 2012 and the launch of many products from industry partners being offered in their A-TACS FG camouflage pattern. They certainly do not want any outstanding legal disputes to put a damper on sales. We provided the full complaint below. To be completely fair the exhibits and complaint only provide one side of the story in the sense that it has not been made public as to why HyperStealth felt DCS was copying their patterns in the creation of their own design. No comment was provided in a request for information from the company which is fair considering the circumstances and due process in presenting evidence. Of course feel free to look at all of the photos presented along with other information provided and you be the judge. At least in your own world. We must also take note that this case has no bearing on the US Army Camouflage Improvement Effort Solicitation. DCS submitted a completely different family of camouflage patterns, which have already been reported as dismissed from further consideration. HyperStealth could still be in the hunt although it is not public knowledge as to which patterns were submitted. Even if it is one of the mentioned patterns or variations thereof, this matter shouldn't effect any further selection process. In the end we hope this is quickly settled out of court. 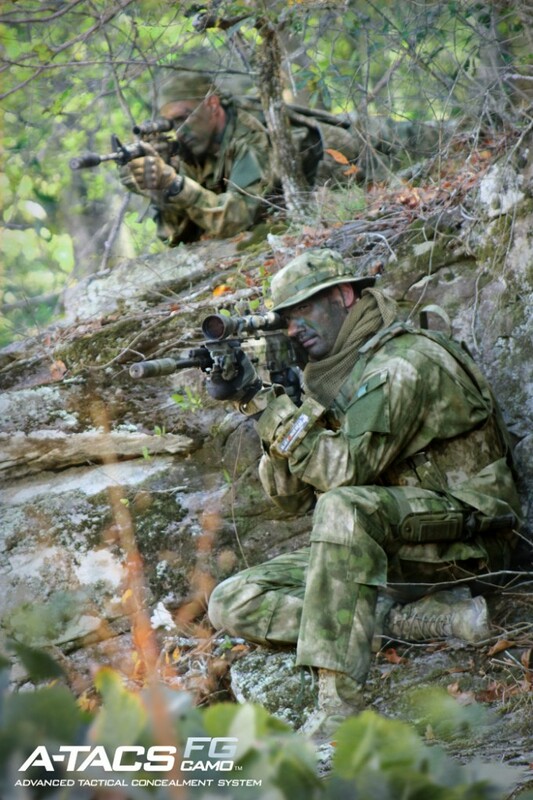 For one, we have a bias in the sense that we want to offer the A-TACS FG as quickly as our partners can provide products utilizing the camouflage. We also want to see further development from each company as they change the camouflage world with their innovations. I'm wondering if this whole lawsuit deal is a direct result of the over zealous lawyers that have been involved in the legal proceedings concerning smart-phone technologies and operating system coding that seems to have become prevalent in todays' society. Too sad to see these companies falling prey to the soul-less lawyers that think anything remotely similar to one product is a direct infringement upon another companies' rights. These companies should have the balls to tell the lawyers to F-Off as far as I'm concerned - there's no similarity in the aforementioned patterns and their lawyers should be fined and warned of disbarment for a frivolous lawsuit! It is a pity you never went to law school. IP lawyers are not ambulance chasers. It is a specialist field where clients seek out the lawyer looking for help with what the client believes to be a breach of their intellectual property. In a specialist area such as camouflage, it is unlikely that the lawyer will have any prior subject knowledge. It follows that the lawyer will be reliant on the client's assertions as the the alleged breaches of IP. The lawyer merely advises of the routes available to the client to resolve the matter and then acts on the client's instructions. If the client wants to litigate, then the lawyer prepares and issues the statement of claim, and initiates the litigation on the client's behalf. I am sure DCS welcomes your opinion that their product bears no similarity to that of Hyperstealth. Indeed, I tend to agree. Unfortunately, neither of our opinions are likely to count in this litigation. I will leave you with one thought. If you ever find yourself in need of a lawyer, pray that you find an over zealous one, rather than a lazy, incompetent one. You have a far greater chance of success that way. I KNOW exactly how these lawsuits started and it wasnt from Lawyers. It was from Guy Cramer creator of the Hyperstealth family of camo patterns. Guy Cramer is the bad apple of the camo industry. All he does is copy other people's patterns and make a bunch of camo concepts most of which never actually get printed on anything. They are just shown as digital representations. He has admitted to taking patterns like Marpat and copying them (altering them slightly)and trying to market them. He got in a jealous tissy (like a 4 year old boy mad because a girl he liked kissed another boy first on the playground)and HE filed a suit against DCS first. The suit that DCS had against him was just to get the case closed and to recover whatever they had to spend on the case. The whole intial case HyperStealth VS. DCS was fradulant anyway. Guy had no actual grounds to fight on. He just likes being in the news and stirring up crap in the industry. Just like he did with the last round of Army camo selections. It's no coincidence that one of the panel members who voted in Hypersteath's submissions owns major stock in the company. The patterns were also rip offs of the Marines Patterns just repixalated. He tried to disguise the brand by bringing in ACS to represent the pattern but it's dirty any way you do it. Personally I think him and that panel memeber should be in jail or at least face formal litigation for fraud.